Cryopyrin-associated periodic syndrome (CAPS) or cryopyrinopathy constitutes three different entities that often overlap: Familial cold auto-inflammatory syndrome (FCAS), Muckle - Wells syndrome (MWS; MIM no 191900), and neonatal onset multi-system inflammatory disease (NOMID). These diseases lie along a phenotypical continuum with increasing levels of severity. Cutaneous, neurological, ophthalmologic and rheumatologic manifestations may help in the differentiation of the cryopyrinopathies. MWS is characterized by recurrent fever and urticarial rash, progressive sensorineural deafness and the development of secondary amyloidosis. Mutations in the NLRP3 gene on chromosome 1q44 causes cryopyrinopathies. Approximately 100 different mutations, mostly missense mutations in exon 3 of this gene have been identified. These are autosomal dominant disorders with varying penetrance, which may also present de novo. The proband was a 27-year-old Indian male, born of a non-consanguineous marriage, with normal developmental milestones. He was admitted with recurrent attacks of high grade intermittent fever, associated with occipital headache, conjunctival congestion and rash for 17 years. The rash was migratory, non-pruritic, maculopapular, mainly over the chest, abdomen, and extensor aspect of limbs with exacerbation on exposure to cold. He had 3-4 episodes per month, each lasting for 2-3 days. He had recurrent episodes of asymmetric non-deforming polyarthritis involving the axial and appendicular joints for 17 years. He also had a slowly progressive hearing loss for the past 10 years. Clinically he had short stature [Figure 1], short neck, conjunctival congestion, diffuse urticarial rash, clubbing [Figure 1] and bilateral papilledema. The rest of the examination was normal. His hemoglobin was 12.8 g/dl, total WBC count 43900/μl (N 88%, L 06%, E 1%, M 05%), platelet count 4.4 × 10 9 /L and ESR 9 mm in 1 hour. C reactive protein was elevated. Renal function tests, liver function tests and urinalysis were all normal. Rheumatoid factor, ANA, C and P ANCA were all negative. Pure tone audiometry showed bilateral severe sensorineural hearing loss with an average frequency loss of 65 dB in the right ear and 55 dB in the left ear. The higher frequencies were affected more than the lower. Brain imaging was normal. Cerebrospinal fluid analysis showed 11 WBCs (all lymphocytes), protein of 98 mg/dL and sugar 54 mg/dL. CSF gram stain, AFB stain and culture sensitivity was negative. 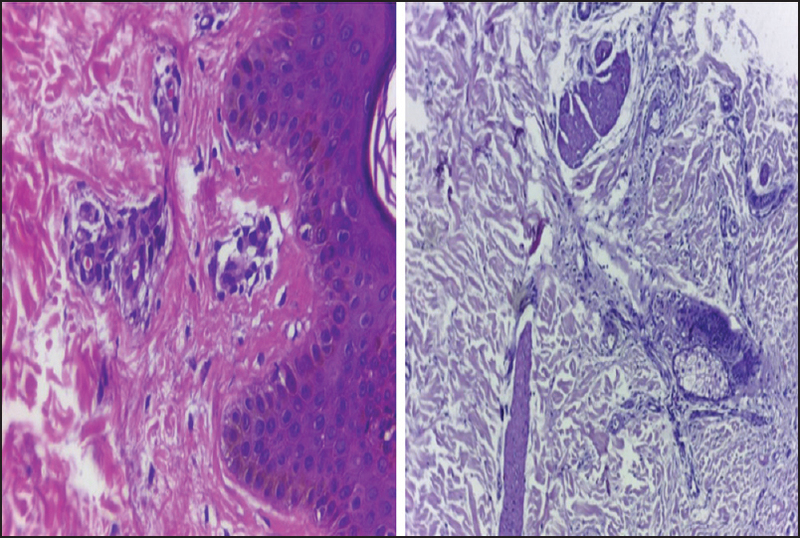 Histopathological examination of urticarial lesions of skin showed normal epidermis, dermal inflammation with perivascular neutrophilic infiltration [Figure 2]. The proband's elder brother, who was 40 years old, had recurrent high grade fever, rashes and polyarthritis from the age of 5 years and progressive hearing loss from the age of 15 years. He had short stature, short neck, urticarial rash, conjunctival congestion, clubbing, bilateral papilledema and bilateral sensorineural hearing loss. Investigations showed neutrophilic leukocytosis, raised C-reactive protein and ESR. Brain imaging and cerebrospinal fluid analysis were normal. Skin biopsy was similar to that of proband. The proband's father had died of chronic kidney disease. The other family members including four sisters and mother were all normal. DNA was extracted from the peripheral blood of the patients. Exon 3 of NLRP3 was amplified in three fragments with the following primers: Forward: 5Ͳ-GTTACCACTCGCTTCCGATG-3Ͳand reverse: 5Ͳ-CCTCGTTCTCCTGAATCAGAC-3Ͳ; forward: 5Ͳ-CATGTGGAGATCCTGGGTTT-3Ͳ; reverse: GGCCAAAGAGGAAACGTACA-3Ͳ; forward: 5Ͳ-ACTACCTGCTGGAAGAGGAA-3Ͳ and reverse: 5Ͳ-GCTGTGGCAACAGTATTTGGA-3Ͳ. Negative and positive controls were included in each run. PCR was validated with gel electrophoresis, and PCR products were purified with a QIAquick PCR purification kit (Qiagen, Venlo, The Netherlands) according to the manufacturer's protocol. Sequencing reaction was performed with Big Dye Terminator v. 3.1 Ready Reaction Cycle Sequencing kit (Applied Biosystems, Warrington, UK). 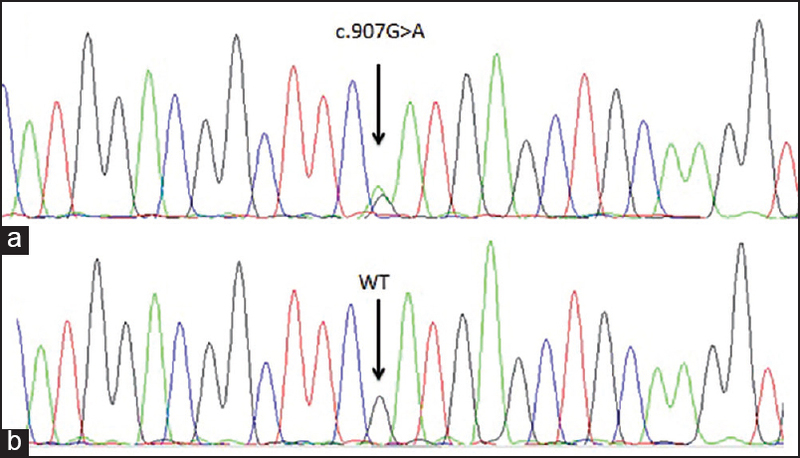 The electrophoretic profiles of NLRP3 sequences were analyzed on the ABI 3130xl Genetic Analyzer by using Sequencing Analysis Software version 5.4. The analysis revealed the presence of a c.907G >A (heterozygous state) mutation in exon 3 on chromosome 1 [Figure 3]. Genetic tests were not done for the other members of the family. On the basis of clinical features and molecular analysis, the proband and his brother were diagnosed to have a cryopyrinopathy. Financial constraints and non-availability of medications in India prevented the initiation of these patients on anti-IL-1 therapy. However, they are being treated symptomatically with steroids during the episodes. The family has been counseled that this is a genetic condition with autosomal dominant inheritance. Recurrence risk in future progeny of affected individuals is 50%. Additional family members can be tested for the mutation in a cost - effective way by targeted mutation analysis. Prenatal diagnosis was possible in at-risk pregnancies by fetal mutation analysis to enable informed reproductive decisions. In our family, the onset of the disease and symptomatology favor a diagnosis of MWS. The two patients also exhibited overlapping features with FCAS as shown by exacerbation of symptoms upon exposure to cold and NOMID like papilledema, chronic aseptic meningitis, and headache. The proband's father had died of chronic kidney disease. Though he had no aforementioned features of MWS, his renal disease may have been due to amyloidosis secondary to MWS. The three diseases are related to mutations in the NLRP3 gene located in the chromosome1q44. Various mutations, mostly missense, in exon 3 of this gene have been identified. Genetic analysis of our family showed c.907G >A, (p.Asp303Asn) mutation in the NLRP3 gene. c.907G >A mutation was previously described in patients from various ethnicities. To the best of our knowledge, this mutation has never been reported from India. The correlation of NLRP3 genotype and phenotype is broad in terms of disease characteristics, penetrance and severity. McDermott et al. reported the first autosomal dominant periodic fever in patients from the Indian subcontinent; later Aganna et al. identified the R260W mutation in them. p.F309S mutation causing NOMID in a 7-year-old girl was reported by Khemani et al. from India. Treatment of MWS patients targets IL-1. Rilonacept, canakinumab or anakinra are the available IL-1inhibiting therapies. Cryopyrinopathies have been reported in the European population but few such cases have been reported from the Indian subcontinent. We report this rare syndrome in two members of a family to highlight awareness of this condition while investigating those with recurrent fever from childhood especially in those with a positive family history. The authors thank Mrs. Dorota Rowczenio, National Amyloidosis Centre, Division of Medicine, University College London Medical School, London, NW3 2PF for their advice and genetic analysis and Dr. Alavi. I and Mr. Mohthash Musambil M.E.S. Medical Sollege, Perinthalmanna, Kerala, for their help. McDermott MF, Aganna E, Hitman GA, Ogunkolade BW, Booth DR, Hawkins PN. An autosomal dominant periodic fever associated with AA amyloidosis in a north Indian family maps to distal chromosome 1q. Arthritis Rheum 2000;43:2034-40. Rowczenio DM, Trojer H, Russell T, Baginska A, Lane T, Stewart NM, et al. Clinical characteristics in subjects with NLRP3 V198M diagnosed at a single UK center and a review of the literature. Arthritis Res Ther 2013;15:R30. Hawkins PN, Lachmann HJ, Aganna E, McDermott MF. Spectrum of clinical features in Muckle-Wells syndrome and response to anakinra. Arthritis Rheum 2004;50:607-12. Farasat S, Aksentijevich I, Toro JR. Autoinflammatory diseases: Clinical and genetic advances. Arch Dermatol 2008;144:392-402. Neven B, Prieur AM, Quartier dit Maire P. Cryopyrinopathies: Update on pathogenesis and treatment. Nat Clin Pract Rheumatol 2008;4:481-9. Aksentijevich I, Nowak M, Mallah M, Chae JJ, Watford WT, Hofmann SR, et al. De novo CIAS1 mutations, cytokine activation, and evidence for genetic heterogeneity in patients with neonatal-onset multisystem inflammatory disease (NOMID): A new member of the expanding family of pyrin-associated autoinflammatory diseases. Arthritis Rheum 2002;46:3340-8. Church LD, Savic S, McDermott MF. Long term management of patients with cryopyrin-associated periodic syndromes (CAPS): Focus on rilonacept (IL-1 Trap). Biologics 2008;2:733-42. Dodé C, Le Dû N, Cuisset L, Letourneur F, Berthelot JM, Vaudour G, et al. New mutations of CIAS1 that are responsible for Muckle-Wells syndrome and familial cold urticaria: A novel mutation underlies both syndromes. Am J Hum Genet 2002;70:1498-506. Aganna E, Martinon F, Hawkins PN, Ross JB, Swan DC, Booth DR, et al. Association of mutations in the NALP3/CIAS1/PYPAF1 gene with a broad phenotype including recurrent fever, cold sensitivity, sensorineural deafness, and AA amyloidosis. Arthritis Rheum 2002;46:2445-52. Khemani C, Khubchandani R. CINCA syndrome. Indian Pediatr 2007;44:933-6.